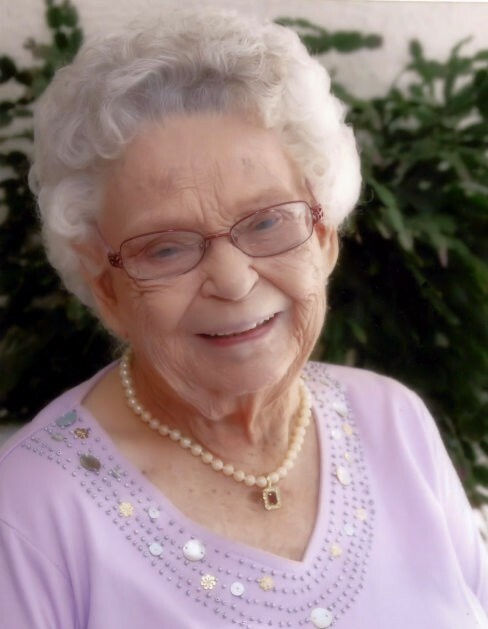 REDDING, Lona B., 99, of Spring Hill, Florida, passed away Friday, April 5, 2019 at her home. Mrs. Redding was born August 21, 1919 in Lenox, Georgia and moved to Brooksville, Florida 42 years ago from Miami, Florida before settling in Spring Hill a couple of years ago. She was a retired waitress and member of the Christian Life Assembly of God Church. She loved crafting, crocheting and needlepoint and also loved gardening, cooking and canning what she grew. She enjoyed baking, especially peanut butter cookies. She is preceded in death by her husband, Jesse W. Redding; son, Ronnie Weeks; stepdaughter, Virginia McCullers; brothers, Bill, Thomas, Charlie, Talley and Hardy Sandefur; and her only sister, Fannie Lowie. Mrs. Redding is survived by her sons and daughter-in-law, Wayne Weeks of Alexander City, Alabama and James & Carolyn Weeks of Spring Hill, Florida; brother, Eugene Sandefur of Miami, Florida; many grandchildren, great-grandchildren and great-great-grandchildren. Visitation for family and friends will be from 6:00 – 8:00pm, Tuesday, April 9, 2019 at the Merritt Funeral Home, Brooksville Chapel, and from 10:00am – 11:00am, Wednesday, April 10, 2019 at the Christian Life Assembly of God where funeral services will begin at 11:00am, with Reverend John Hensel and Reverend J. C. Weeks officiating. Interment will follow at Florida Hills Memorial Gardens, next to her husband, Jesse.